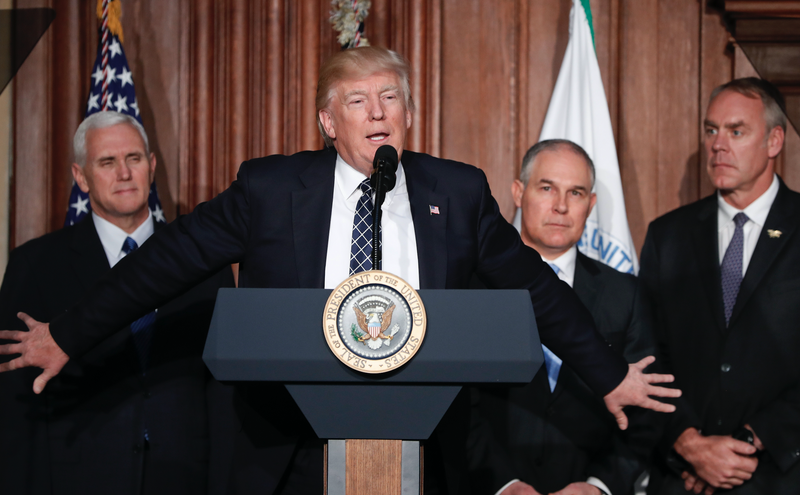 On Tuesday, President Trump pledged to end the “war on coal” by rolling back the Clean Power Plan, an Obama-era federal policy that compels states to reduce carbon emissions from power plants. China responded Wednesday, reaffirming its commitment to investing in clean energy and honoring the Paris Agreement, an international accord to tackle climate change with progressively more stringent carbon emissions goals. The CPP, as Trump and EPA-head Scott Pruitt argue, overburdens the coal and mining industries with needless regulations, leading to massive layoffs and power plant shutdowns. That’s one way of putting it. Another: A man who dismissed climate change as a “hoax” created by the Chinese, and a climate denier who still wants to debate the laws of physics, are repealing environmental regulations in order to save an industry that isn’t being killed by environmental regulation. Trump’s regressive climate policies fly in the face of the consensus of scientists and economists, who say natural gas and renewables like solar and wind power are eclipsing coal as cheaper, cleaner energy sources. In under 100 days, Trump has ceded Obama’s hard-earned position for the US as a global leader on climate change to China, the world’s largest emitter of carbon. All to ressurect an industry that experts agree isn’t coming back. Not about to lose an opportunity to drive that point home, Chinese officials today reiterated their commitment to the Paris Agreement, and subtly chided the US for its backwards-facing climate policies. While Trump ignores the energy transition to renewables, China is accelerating it. The Chinese government is shedding as many as 500,000 jobs in the coal and steel sector, offering job re-training and unemployment benefits to affected workers. Additionally, China is soaring ahead of the US in its green energy investments, installing a record 4 million solar panels from 2013 to 2017. In 2015, it hit a global record for newly-installed wind power capacity, 32.5 GW. China is on track to meet—and exceed—its carbon reduction commitments under the Paris climate agreement well ahead of schedule. China’s motivations for pursing green energy are two-fold: Not only are cities like Beijing choking in smog, but it sees an opportunity to become the number one international provider of renewable technologies to developing nations. Since Trump was elected president, there’s been talk of China stepping forward to replace the US as the global leader in producing energy innovations. Trump’s actions this week only serve to cement the idea that one of America’s biggest geopolitical rivals will be architect of the global energy transition. Meanwhile, Trump continues to peg the livelihood of much of his voting base to the rapidly flatlining coal industry. Maybe, during their meeting in April, Chinese President Xi Jinping could explain some basic economics to Trump.